HONG KONG, Nov 1, 2018 - (ACN Newswire) - Chinese biologic drug developer Innovent Biologics (Innovent) becomes the 4th pre-revenue biotech firm to list in Hong Kong yesterday. The seven-year-old company, underpinned by a value proposition of its strong pipeline of 17 drug candidates, is determined to address the multibillion dollar antibody drug market, which is currently shared by a few multinational companies. Under the current fluctuation of market performance, the company may face headwinds which dominated the market recently. But all these have not stopped the biotech unicorn from reaping USD 421m from its public debut. Innovent Chief Financial Officer Ronald Ede said that the company decided to proceed with its IPO plan amidst a global market rout mainly thanks to the strong investors' support who understand the company and its pipeline. "The market certainly has its own mechanism...but we think that with the strong achievement the company has couple with reasonable pricing of the IPO, our investors will continue to support us," he said. Innovent's bookbuild was well-received by large well-known global investors, way outperforming general market's expectations. The company priced its Hong Kong initial public offering (IPO) near the top of a marketed range, or HKD 13.98 apiece. The 236.35m shares it offered had an offering price range from HKD 12.5 to HKD 14 each share. Though Innovent may still see market challenges, as arguably to other recently listed biotech peers that have not performed so well and have fallen significantly under their IPO price, Innovent is better prepared to tell the market where its true value lies. 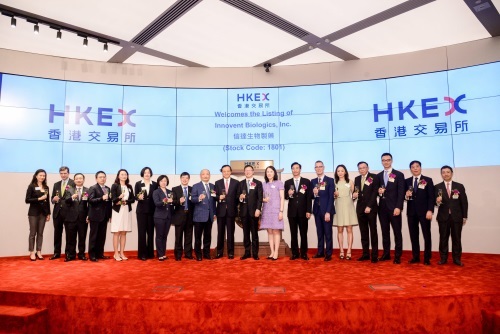 In all, when Hong Kong gets more biotech analysts and when general investors have more knowledge about biotech sectors, the company believes the market will perform according to the true value of a company's performance. Innovent's world-class drug portfolio should provide better risk protection for its earnings potential. The company's most mature biological drug Sintilimab (anti PD-1) for cancer treatment has already applied for new drug application (NDA) and plans to launch in China next year. There are also three biosimilar drugsamong its 17 new drugs pipeline that are in phase 3 clinical trials in China, which are aiming to submit for NDA next year. All these products have the huge potential of tapping into China's massive biologics market that is vastly underpenetrated. The company's ambition is also underpinned by star pre-IPO and cornerstone investors for its initial public offering in Hong Kong, which include Fidelity-related investment units Eight Roads and F Prime, Lilly Asia Ventures, Legend Capital, Singapore's sovereign fund Temasek, Capital Group and other well-known investors. Eli Lilly is also a company's business partner, the two jointly developed Sintilimab, which is one of the core products with promising market protential. "China has the highest burden of cancer patients of all countries in the world," stated Michael Yu, Innovent's founder, chief executive officer and chairman. "At Innovent, an innovative biopharmaceutical company in China, we are dedicated to take advantage of the latest technological advances in science to develop and commercialize new medicines for cancer patients." "Innovent will also combine different antibodies from its rich product pipeline for cancer immunotherapy. The company will provide affordable, high-quality biopharmaceuticals for more patients", Yu added. On the listing day, stock price of the company traded at $14.3. The shares rose up to $16.96, closing at $16.58. The closing price was 18.6% above the offer price. Net income of $1,300 per 500 shares, excluding fees.